Immigrants come to the United States from all over Latin America in search of better lives. They obtain residency status, find jobs, pay taxes, and they have children who are American citizens by birth; yet decades may go by before they seek citizenship for themselves or become active participants in the American political process. Between Two Nations examines the lack of political participation among Latin American immigrants in the United States to determine why so many remain outside the electoral process. Michael Jones-Correa studied the political practices of first-generation immigrants in New York City's multiethnic borough of Queens. Through intensive interviews and participant observation, he found that immigrant participation was stymied both by lack of encouragement to participate and by the requirement to renounce former citizenship, which raised the fear of never being able to return to the country of origin. The hesitation to naturalize as American citizens can extend over decades, leaving immigrants adrift in a political limbo. Between Two Nations is the first qualitative study of how new immigrants assimilate into American political life. Jones-Correa reexamines assumptions about Latino politics and the diversity of Latino populations in the United States, about the role of informal politics in immigrant communities, and about gender differences in approaches to political activity. "A valuable contribution to the growing literature on transnational immigrant communities.... Persuasive and engaging." "The questions asked in this book are fundamental to the future of the policy.... Jones-Correa offers a solid contribution to the emerging study of immigrant political adaption." 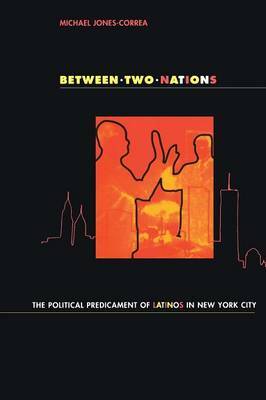 "This is ground-breaking work on a truly important topic: the emergence, or perhaps the lack of emergence, of Latino/immigrant politics and a Latino political identity in New York City. Between Two Nations is a readable, well-researched, and highly evocative study, and Jones-Correa does an admirable job of rooting his work in a larger context, relating his study to both contemporary developments nationally and to historical precedents." "This well-researched book provides an excellent and sophisticated analysis of a neglected issue: the political marginality of Latin American immigrants to the US, many of whom acquire residency but not citizenship as soon as they are able."